The slow moving Basking shark, being the second largest fish in the sea can reach an incredible size of 10 metres,(although the average adult length is from 6.5 to 9metres) considering that they survive by trawling with open mouth for the smallest of life, the planktons. Other species of cetacean who visit our waters are, Porpoise, Pilot whale, Bottlenosed dolphins, Risso’s dolphin, White sided dolphin, Common dolphins, Sperm whale, and, occasionally Humpbacked whales, and Orca. The odd visitor which we don’t often associate with the West of Scotland is the leatherback turtle, although not the most common of visitors to our shore, it is occasionally spotted around our coast, feeding on the numerous jellyfish, carried here by the Gulf stream and following the ocean currents, we know they are well travelled individuals and have come a long way.Our common seal populations who stay with us throughout the year begin their pupping in June and the addition of the pups hauled out on the rock alongside mum is an extra bonus. Our common seal populations who stay with us throughout the year begin their pupping in June and the addition of the pups hauled out on the rock alongside mum is an extra bonus. 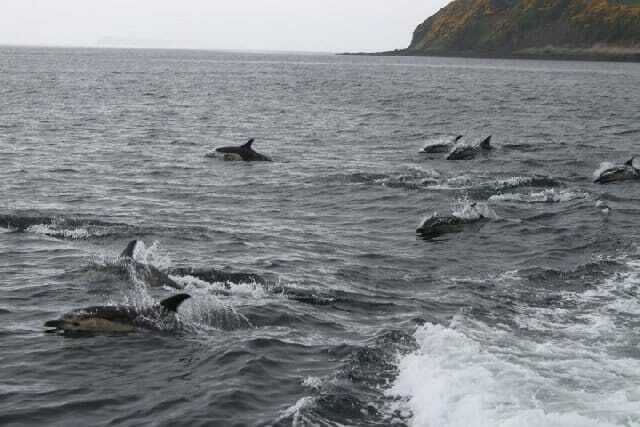 The islands of Loch Dunvegan, lochbay, and the Ascribs to the East of the Waternish peninsula have been designated Special Areas of Conservation.